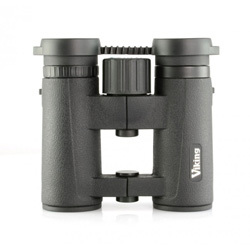 Released in 2013 as a follow on model from the original Vistrons, the Vistron Pros offer improved optics and ergonomics over their predecessor. There are currently 4 sizes on the market from 8x32 to 8x50 with RRPs starting from £199.95. For this review, we will be looking at the 3 most popular models, the 8x32, 8x42 and 10x42. Starting with what's inside, the Vistron Pro models benefit from BAK4 prisms, fully multi-coated optics and phase correction. 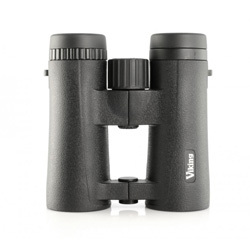 In simple terms, these layers and coatings ensure the binoculars gather as much light as possible without loss of contrast or resolution. There are better coatings available but it's rare to find them in this price range, so the Vistron Pros are off to a good start. They certainly perform as well as others of a similar price. The Opticron Explorers, a model I've always been fond of, is much of a muchness optically, offering a very similar field of view and performing on par throughout testing. The Vistron Pros feature a 6.5, 7.4 and 6.2 field of view on the 8x32s, 8x42s and 10x42s respectively, nothing spectacular but ample enough with each model and I didn't at any point feel disappointed or that they were lacking that extra width. With all 3 models tested I found sharpness (resolution) to be very good and they perform very well for retention of detail at the edges, with only a little softening meaning you get full use of the field of view. Contrast and brightness is also very good, the hazy conditions of a cold November morning proving a good test. Later in the afternoon, the 8x42s proved their superior exit pupil (5.25mm) could gather more light and keep you birding longer, something worth considering depending on how much time you intend to spend using the binoculars. Close focus is quoted at 1m for the 32mm model and 2m for both 42mm models, in tests these figures were all within around 10cm of my own and are on the top end of the scale, especially the 8x32s. Weighing a minuscule 371g, the 8x32s owe their lightweight attributes to the open hinge design and polycarbonate body. The 42mm models are made from a lightweight magnesium alloy and are still just about as light as you'll get for a 'full size' pair of binoculars, each weighing a tad over 600g. With the textured rubber exterior on all models, you don't notice the difference in materials used inside and I've been reassured the polycarbonate (or plastic for short) is put under intense pressure in testing before being used. The Vistron Pros are 100% waterproof and are nitrogen filled to prevent internal condensation, features I find reassuring in our great british weather. The focus wheel turns smoothly without being too sensitive, taking about 1 ½ turns from minimum focus to infinity. The click stop diopter is, like most, placed under the right eye cup and offers easy adjustment when needed. The open hinge design isn't just about looks and weight, it also favours the comfort of the bins, allowing for a sure grip even with one hand. On the whole I'm fond of the way they handle, perhaps not as much as (my favourite for ergonomics) the Hawke Frontier ED which benefit from better grip and a thumb indent, but better than many others I've tested. Eye relief is adequate on the 8s but perhaps a tad low with the 10x42s only offering just over 13mm. It certainly didn't give me any trouble in practice but may not suit everyone. The eye cups themselves twist out smoothly and were a pleasure to use. A very, very good pair of binoculars. Certain binoculars grow reputable for quality and value for money, the Vistron Pros lack the reputation right now but I believe can certainly justify it. I adore the little 8x32s for their size and weight, and the 42mm models for either better light gathering capability or longer magnification. Which you choose would depend on which factors are most important to you but I have no hesitation in recommending these binoculars. 2017: The Vistron Pro range has now been discontinued.